Previously known for his skill in fighting games like Killer Instinct, SightlessKombat, who has been blind since birth, has recently begun exploring shooters and explaining how he plays them on his YouTube channel. His most recent video, which was highlighted on the ResetEra gaming forum, dives into Gears of War 4 and the way he’s managed to combine a strategy based around a melee character build with accessibility features added to the game last year to successfully play its Horde mode. It wouldn’t be feasible for SightlessKombat to try to shoot everything to death, he says, but he navigates the mode using sound cues and relying on melee attacks. He plays mostly Juvie Madness mode, which includes a bunch of enemies who don’t use guns, and he plays on the Forge map, where the confined, grid-like spaces makes it easier for to maneuver. His character build is geared around this strategy, using cards primarily aimed at maximizing his survivability. They include ones like Execution Bonus, which causes enemies to drop more power when killed; Brawler, which increases melee damage; and Health Boost, which doubles the player’s health. This build allows him to stay in the thick of things where the most sound cues are without dying right away. 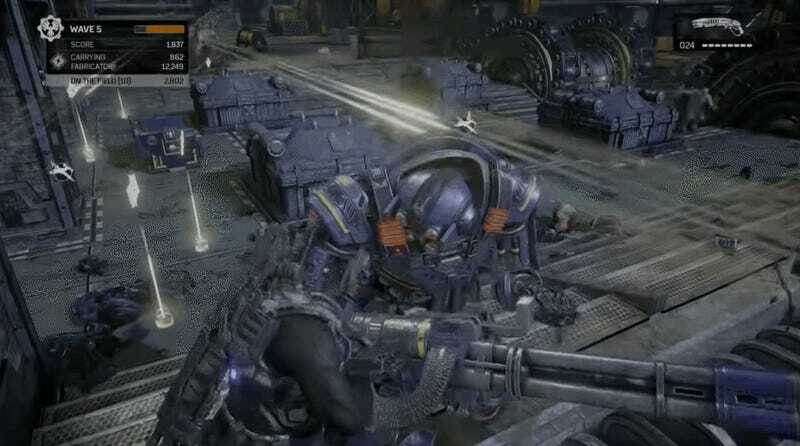 He discerns between Juvie and Tracker enemies by their “squishy” and “mechanical” sounds respectively, and he defeats them using the wide radius of damage provided by the the shotgun blasts and melee attacks, both of which don’t require precise aiming. The increasingly high-pitched squeal as the Trackers close in is especially important, since that’s how SightlessKombat knows when they’re within range and can be kicked away before they explode. The Protector robots are much more difficult to deal with than the regular enemies. SightlessKombat explains that he tries to lure them into the sightlines of the sentry guns, which he can tell he’s done because of the sound of the gunfire. But in later waves there’s so much going on that the difficulty comes as much from the cacophony of sounds as the increase in enemies. One of the most helpful features is Fabricator Ping, which developers The Coalition added in the June 2018 update. Fabricator Ping allows players to elicit a ping sound from the Fabricator device on the map when activating their Tac-Com radio. This makes it possible for players who can’t see to still be able to quickly locate the Fabricator between enemy waves so they can purchase defenses like spike traps and sentry guns. At the time the developers said the feature was “inspired by feedback from our amazing fan SightlessKombat, who plays Gears without sight regularly using a variety of audio based cues.” In the months since it was added it’s helped him progress even further. There are still more features SightlessKombat would like to have added to the game, like the ability to ping the individual pieces of Power dropped by dead enemies, as well as the ability to still hear the wave countdown while using the Tac-Com. With Microsoft pushing to make their games more accessible, it’s possible these and other features could end up making it into future Gears of War games.